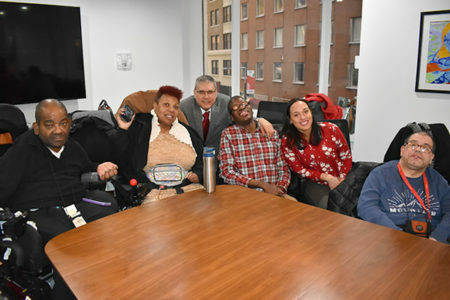 On Tuesday, February 19, 2019 Adapt Community Network’s newest members of the Advisory Executive Council were sworn in by CEO, Edward Matthews. Twelve new Elected Officials were inaugurated at the 80 Maiden Lane celebration. Guests included family and friends of the newly elected officers as well as members of the ADAPT Senior and Executive staff. During November and December 2018, many candidates campaigned for these coveted positions. With assistance from their campaign managers, family and friends, the candidates visited ADAPT locations around NYC sharing their platforms and making campaign promises. Vernita Paige was sworn in as President, while the Co Vice-President positions went to Jean Alcindor and Melissa Cabrera. Other offices filled were Faiman Lee as Secretary and new positions of Borough Representative. Brooklyn is represented by Earnest Walker, Chris Taylor, Matthew Sinclair and Tymique Gannaway; Tawn Farrell and Jeffrey Gale were selected to represent Manhattan; Nicole Roper and Paul Rivera hold the title for the Bronx. In these roles, the executive council will make sure ADAPT’s program participants have a voice in what happens at their Day Hab sites, Residences, and the agency at large. This is in keeping with the agency’s commitment to fostering independence among the people we support. Those elected will serve a two-year term on the executive council, which meets quarterly.